How to Smoke a Turkey Two Ways | Prepare the juiciest smoked turkey you’ve ever had! Cut into pieces for easy smoking. Packed with delicious flavor this truly is not only the best smoked turkey we’ve ever had but it beats ALL the different turkeys we have had in the past. Every good turkey needs a good gravy and I have just what you need. Using the juices from a smoked turkey to make a gravy can be tricky. I’ve tried it and the smoky flavor was way too strong. So, I came up with a way to make turkey gravy without the drippings! 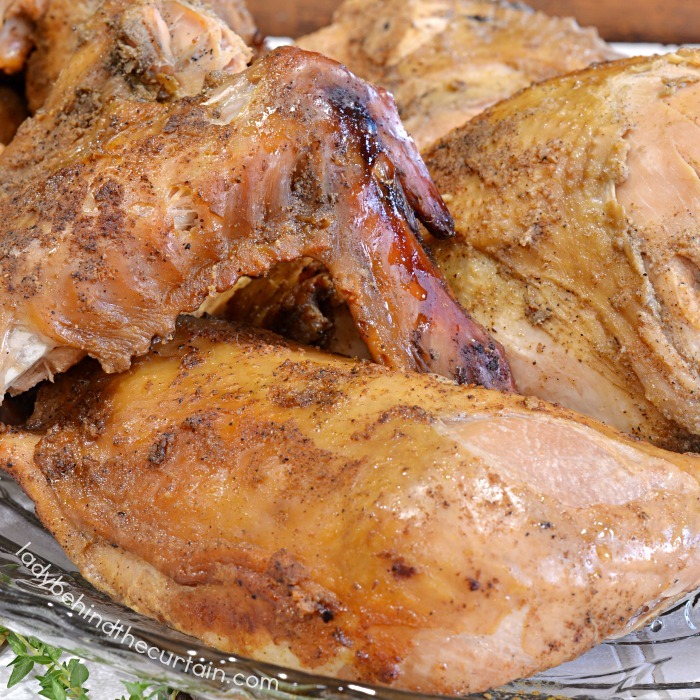 It’s delicious and your guests will never know or care that you didn’t use turkey drippings! 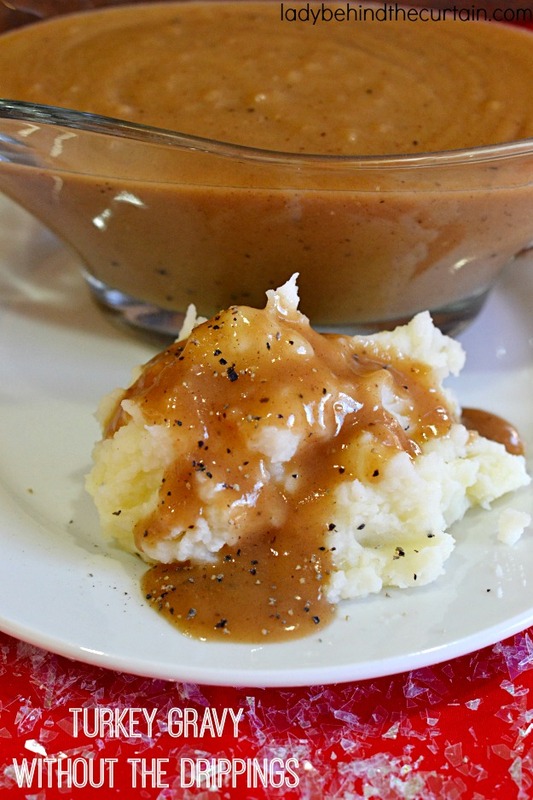 Click here for the recipe—->>>>TURKEY GRAVY WITHOUT THE DRIPPINGS. No matter how you choose to cook your turkey you MUST and I’ll say it again MUST brine your turkey! Ever wonder why no matter how careful you are and how perfect your turkey looks it’s still dry? Trust me when I say if you soak your bird in a brine you will end up with the juiciest turkey you have ever had. 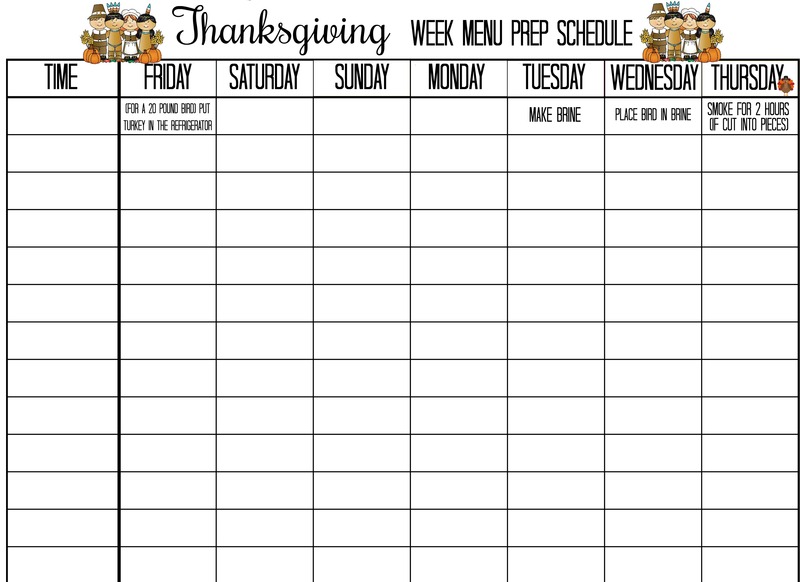 RULE OF THUMB FOR THAWING YOUR TURKEY IN THE REFRIGERATOR: 24 hours per 4-5 pounds (example: 4 days for a 20 pound turkey). Fill the cavity of the bird with a couple apples, a large white onion, 3 celery stalks, all cut into chunks. Melt butter in a sauce pan, add the chicken broth, hot sauce, garlic and Cajun seasoning. Whisk together, bring to a boil. Take off the heat to completely cool. Inject the breast at 3 to 4 locations on each side and do the same for the legs and thighs. Secure the legs and wings with twine. In a large pot bring 1 gallon of water to a boil, add salt, brown sugar, molasses, honey, barbecue rub and bay leaves. Once ingredients have dissolved turn off the heat, add an additional gallon of water and allow mixture to cool. Place turkey in a trash bag, pour in the brine, thyme and peppercorns. Top the turkey off with an additional gallon of water or until the entire bird is covered. Place in an ice chest covered with ice for 24 hours. Remove turkey from brine, rinse under cool water. Drain and pat dry. Spray the outside of the turkey with non stick cooking spray. Apply the seasoning mix to the outside making sure to cover everything; then apply a light layer of barbecue rub. When ready to smoke, add the apples, onion and celery to the cavity. This helps the turkey to cook even. Place cut turkey inside 2 jumbo 2.5 gallon bags and pour in the brine. Add the half thyme bundle and half the peppercorns to each bag. Pour brine into each bag until the bird is covered. Place in an ice chest covered with ice for 24 hours. Remove turkey from brine, rinse under cool water. Drain and pat dry. Soak wood 30 minutes (I used Apple Wood). Smoke 225°. Place on the top rack, turkey breast and wings. Bottom rack is the thigh and drumstick pieces. 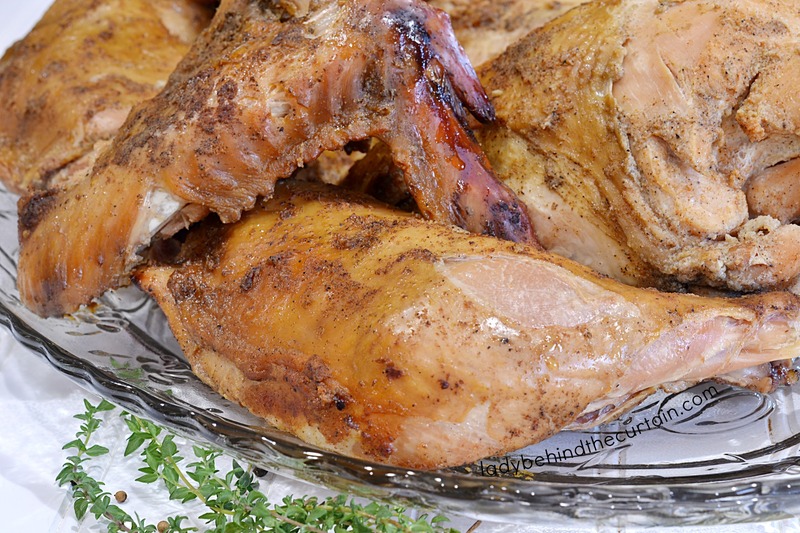 The breast should register 165° while the thighs should be 175°. 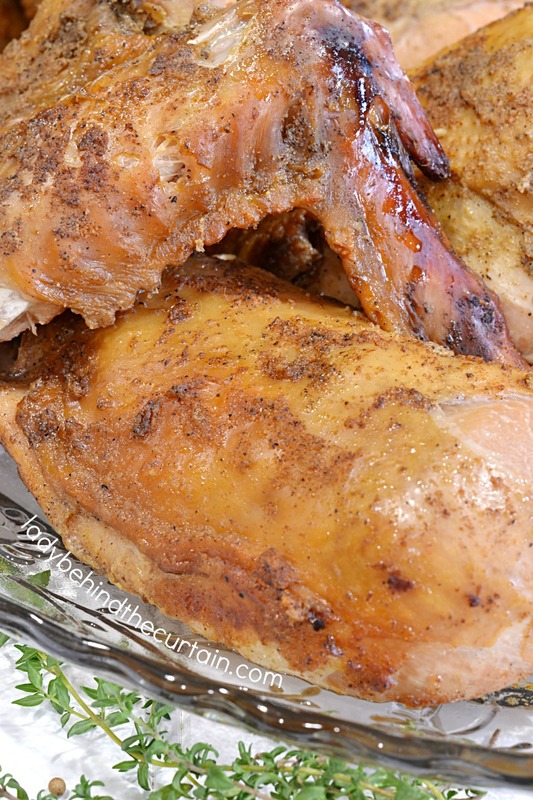 If the bird is getting too dark, wrap pieces in foil to protect it from browning any further.